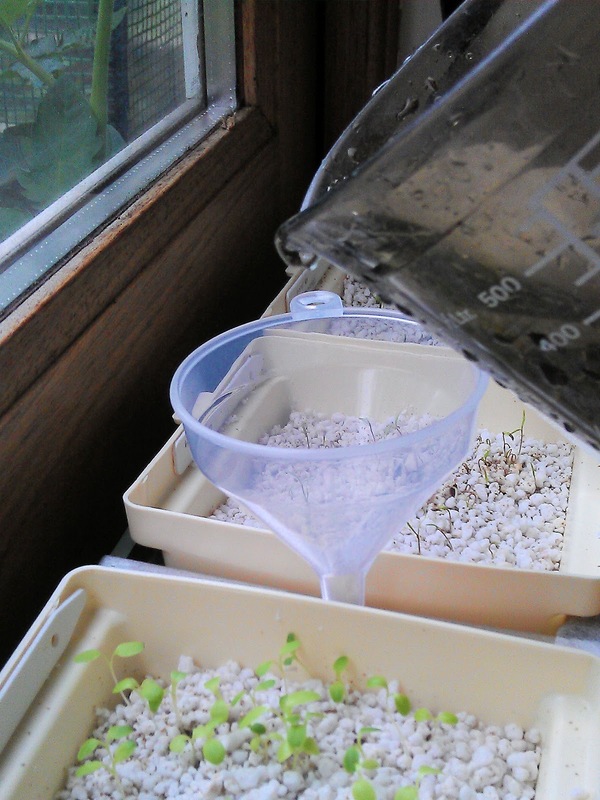 Mixed salad seedlings growing hydroponically, without soil. I don’t know what they put in bagged salad in Australian supermarkets, but I wonder what the author thinks soil consists of, if it’s not a chemical cocktail itself. Conventionally grown plants have their roots in soil, which is typically made up of minute rock particles, organic matter (material which was once living, now decayed) and water. The more fertile the soil, the more chemically rich it will be, especially in nitrogen, potassium, and phosphorus, the three main nutrients needed by plants. However, the soil isn’t necessary for plant growth; it’s only there as the medium for delivering water and nutrients to the roots. Hydroponic growing eliminates the soil and concentrates on getting water and nutrients directly to the roots. Growing hydroponically isn’t the “complete opposite” of organic growing. 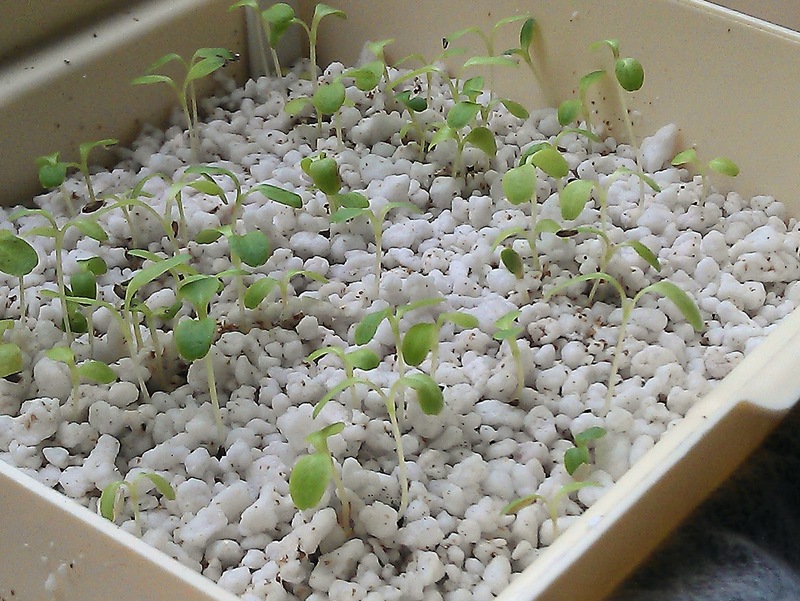 You can incorporate many organic elements into a hydroponic set-up – using organic coir as a growing medium, for example. I suspect that what makes people suspicious of hydroponic systems is the micro-managed nature of it. What an organic philosophy and hydroponic growing have in common is the desire for sustainability. Both methods are far less fuel-intensive than using manufactured fertilisers. Organic systems aim to reduce soil erosion and exhaustion with the addition of organic matter; in many hydroponic systems, the growing medium can be reused many times. 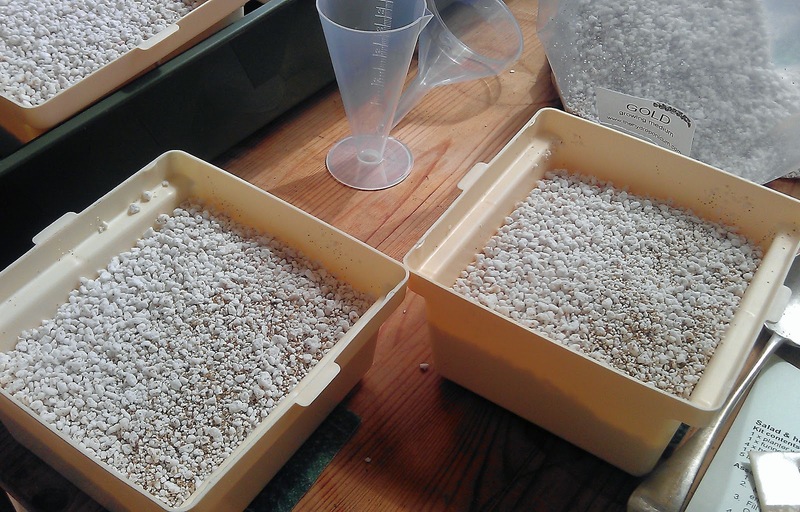 For example, perlite, the rock granules which are often used to anchor the roots, can be sterilised in a microwave and then used again for the next batch of hydroponically-grown seedlings. The micro-management that delivers precisely the nutrients needed to the growing plants also means there is far less waste. If you look around on the Internet you’ll find off-puttingly long lists of technical equipment required for a hydroponic set-up: pumps, filters, hoses, lights. 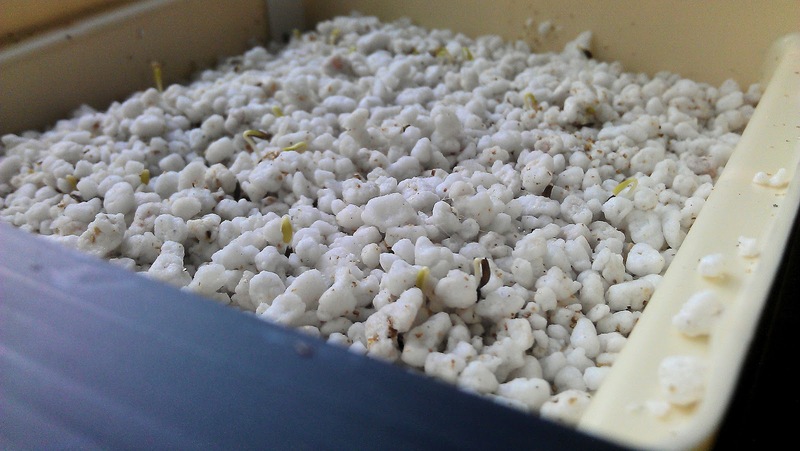 You would be forgiven for thinking it’s less like growing plants and more like a laboratory experiment. 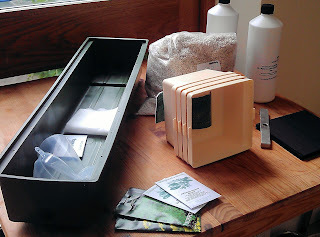 However, much of the expensive and hi-tech kit is needed for hydroponic growing on an industrial or commercial scale. To successfully grow salad leaves an herbs on a windowsill, some pots, water and a soil-less growing medium is all you really need. And your ‘nutrient soup’ of course. We used a simple base kit from The Achiltibuie Garden. Based in the north-west highlands of Scotland, this company specialises in developing hydroponic growing systems for domestic use. Many of their systems are modular, so that you can add extra units to the base kit if your needs increase. This windowsill kit shown below, is good for raising salad cut-and-come-again leaves and herbs. 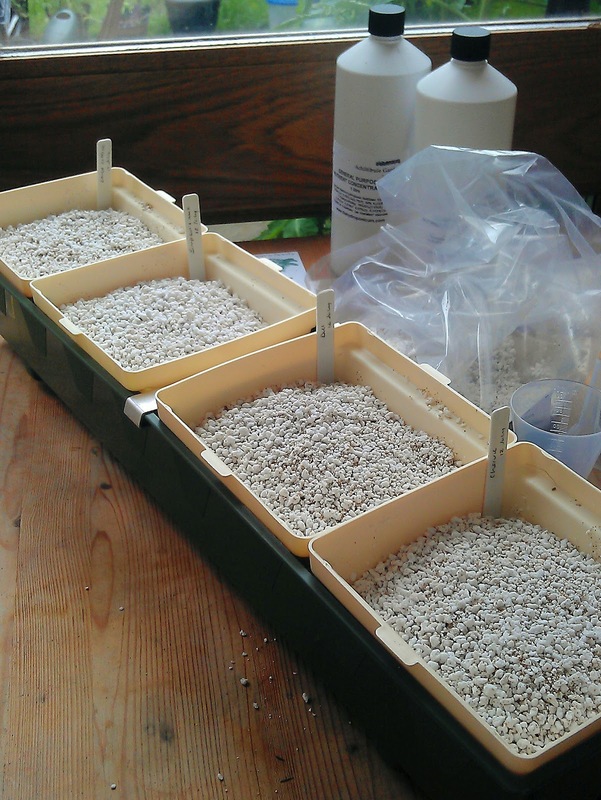 The kit: long plastic trough and four pots. 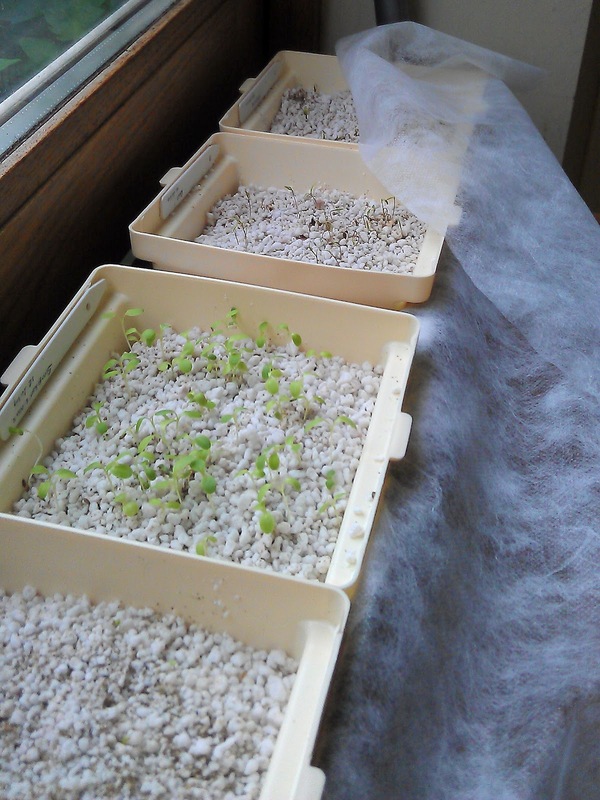 The growing medium, a mix of perlite and vermiculite, containers with liquid nutrients and four packets of seeds. 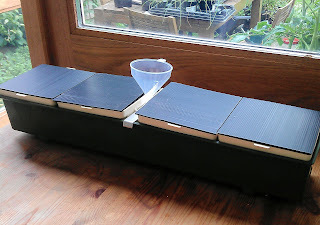 The absorbent material which fits into the slotted base of each pot will take up water and the liquid nutrients into the pots. The pots are filled with the perlite/vermiculite. This growing medium is there to anchor the roots and so keep the plants stable. Its structure means there is still air held in the growing medium and its ability to hold water means the plants can access the liquid feed. Seeds are sown in each pot and lightly covered with more perlite/vermiculite. 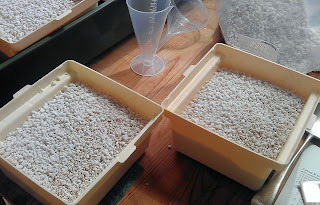 The pots are covered to keep the seeds dark until germination. 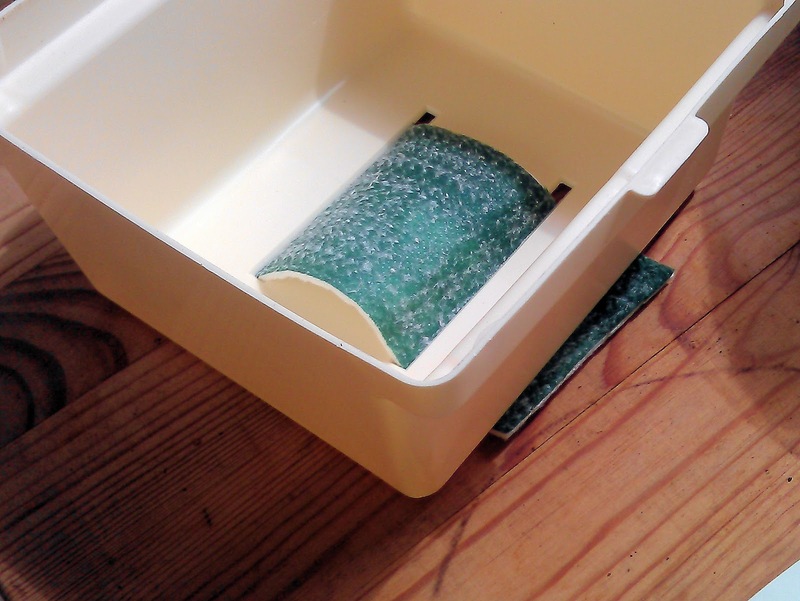 The funnel in the middle delivers water to the base of the trough, from where it can be taken up by the absorbent wicks protruding below each pot. Once germinated the seedlings are covered with a strip of fleece to provide a protective ‘micro-climate’. Topping up the water beneath each pot via the funnel. Our seedlings ten days after germination. 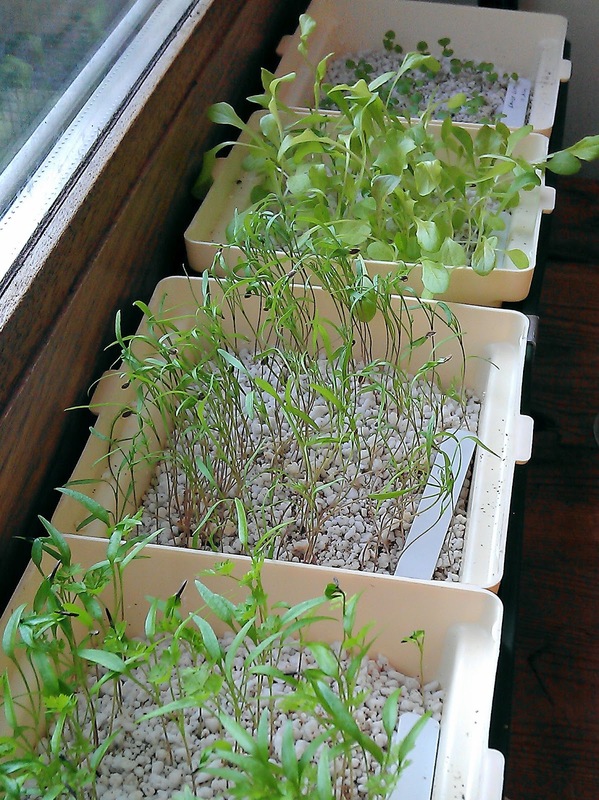 From the bottom up: chervil, dill, salad mix and lamb’s lettuce. We’ll be discussing hydroponic growing in more detail in a future Secret Garden Workshop, looking at ways to set up a simple system in a restricted space and the most suitable plants for this kind of set-up. 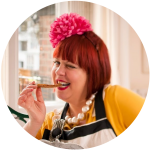 Keep an eye on our Events pages for scheduled dates. Highly detailed discussion of hydroponic tomato growing, including a history of hydroponic development. A detailed overview of hydroponic systems.